Another 'Outfit Inso' post for you guys, this time featuring a little favorite of mine - the Black Bomber Jacket. The bomber jacket has been a favorite with most brands for a while now, and doesn't seem to be going away anytime soon. It's casual style and relax fit mean it can be dressed up for down or most occasions and is super easy to pair up as part of your daily wardrobe or to create a smarter, more stylish look. I'm a fan of the shorter style, and think the shape of a bomber lends itself to suit most body types. I know not everyone has gotten their hands on one yet, so I wanted to create a quick 'how to' post, with an idea of how to style a bomber with the current trends in mind. This actual jacket is from a relatively new brand here in the UK, called Maniere de Voir. They offer current trends and head down the minimalist styling root, with a monochrome colour pallet at the centre of the current collection. The price point is also pretty good compared to other brands and their attention to detail is great. 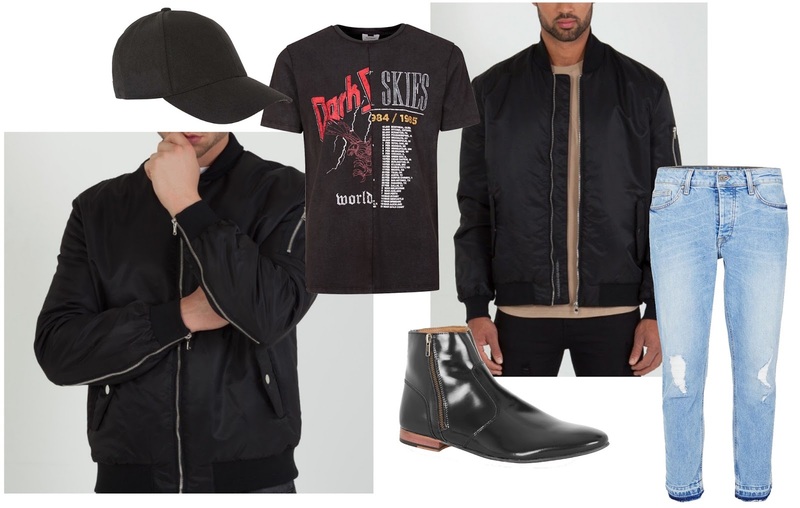 The black bomber lend itself to the current 'urban rock' inspired trend, with retro band tee's and distressed denim at the focal point. This look I've put together is easily achievable and gives that casual 'LA' vibe whilst keeping the outfit wearable and on trend. The key pieces can also be worn as part of other looks, and the jacket will see you right through the season and become a firm favorite.